Natural resources are, especially in Africa, essential for maintaining or improving people’s livelihood. Despite the availability of many tools, expertise, local practices and indigenous knowledge, the concept of Integrated Natural Resources Management (INRM) has hardly been brought into practice. The AfroMaison project was set out to contribute to the challenge of putting integrated natural resource management in practice at meso-scale by providing a practical approach and tools that can be applied in a variety of environmental and socio-economic conditions. Institutional strengthening and improved interaction between sectors, scales and communities. 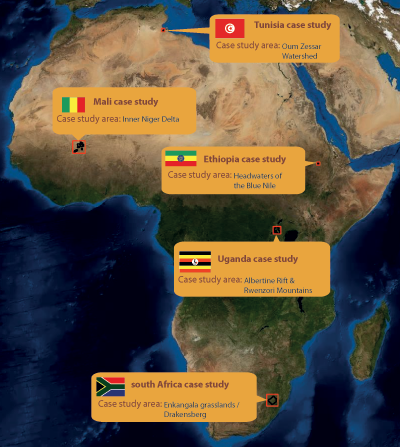 Active support of authorities and stakeholders at the meso-scale has been essential for its success; as well as a solid dissemination and capacity building strategy.The outcomes of AfroMaison are insights and guidance on putting INRM in practice and tools supporting the development of operational INRM strategies which are both embedded in local traditions and culture, and scientifically sound. These are presented in two key outputs. 1) Guideline for natural resources managers (link guidance): based on the case studies, the Guidance Document outlines: i) challenges encountered for implementing INRM in Africa, and proposes strategies and approaches to address them, ii) tools and methodologies for a practical approach to INRM, and iii) insights, conclusions and recommendations when implementing INRM approaches. 2) Toolbox for natural resources managers (link home toolbox): besides a number of AfroMaison developed and tested tools it leads users to existing resources available on the web and encourages the community of practitioners to keep adding resources. To increase user-friendliness, different search possibilities have been added to the toolbox, allowing for a better match of tools, user needs and context. Tools for spatial planning; covering tools for discussion and negotiation on alternative land use alternatives (trade-off analysis, multi-criteria) and spatially-explicit impact assessment. Furthermore, external pressures, impact on ecosystem goods and services and livelihood, vulnerability and resilience has been studied and discussed at case study level. 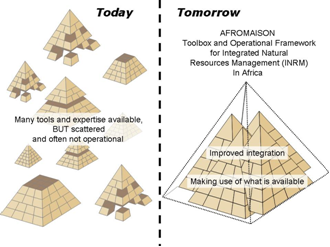 The concept of AFROMAISON: The available tools and expertise as building blocks for the operational "house" of integrated natural resources management (INRM) (based on Overton et al., 2002). AFROMAISON links to the French word for "house" (maison).